By now you’ve noticed a theme that goes something like this. Industrial brewers back in The Day (pre-1980) grew tired of paying higher prices for unreliable supplies of European noble aroma hop imports. The Industrials tasked Dr. Haunold, the People’s Hopmeister, to breed noble hop surrogates with a similar oil profile but with higher alpha acid, higher yields, and superior disease resistance. Dr. Haunold delivered, and then some. He delivered, but it turned out the Industrials, after driving the research and breeding, wound up seldom utilizing the new and improved noble “mimics,” as in the late 1970s they began trending away from aromatic lagers and pilseners and towards super alpha varieties for bittering only. The craft breweries came along in the mid 1980s and began taking a greater interest in the noble aroma mimic “cast offs’ for uniquely American style pale ales. Many crafties, however, continued to be seduced by the mystique and aura of European, Old World hops (Saazer, Tettnanger, Hallertau Mittelfrueh). They were willing to pay more, as securing ginormous supplies from afar was not a major concern for smaller, start-up brewers. In recent years, the dollar has weakened against the Euro, which has resulted in higher prices for European hop imports. Meanwhile, overall annual hop acreage in Oregon has dropped significantly in the past decade. We’ve already shown that Sterling and Santiam are darn good substitutes for Czech Saazer and German Tettnanger, respectively. For many of the same reasons, the same holds true for Mt. Hood, Liberty, Ultra and Liberty, all excellent replacements for Hallertau Mittlefrueh, another august noble aroma from Old Bavaria. How old? The literature says Hallertau hops began gracing Bavarian gardens in 736 AD and sanctifying brews in about 1100. Dr. Haunold released all four of the U.S. mimics of Hallertauer mf between 1990 and 1993 (the “mf” refers to the “medium early’ maturation date, circa late August in Germany). For each of the above named varieties, the yields in the US are much higher. The US varieties have higher alpha acid percentages (except for Crystal). The oil profiles are comparable. The comparative risk of crop-devastating diseases, pests or climactic “acts of god” for US varieties is far lower – summer hailstorms in the German Hallertau region are not freak occurrences. Each, with the exception of Crystal, found favor with the Industrials (viz, Anheuser Busch, Strohs, Coors, Labbats, Modelo), largely because Al boosted the alpha juice. Crystal’s alpha, however, stayed even with it’s land race progenitor at around 3-5%, and the Industrials rejected it. Al was ready to toss Crystal and would have but for the lobbying of a single hop merchant who thought the burgeoning crafties would like its aroma and he convinced Al to release it. Al is particularly fond of Mt. Hood, which is a ½ sister of Ultra, Liberty and Crystal. 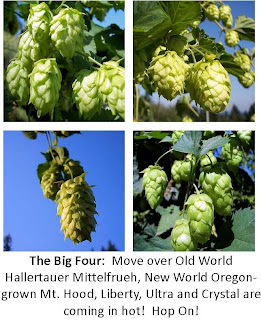 It’s parentage is as follows: 2/3 Hallertauer mf, 1/6 Early Green (a UK hop that came to the US in the early 1930s and faded away with little fanfare), and 1/6 unknown German aroma male. Mt. Hood, as well as its half-sisters, are triploid cultivars, which, Al explains, means that it tends to be vigorous, higher yielding, and nearly seedless, which is a bonus for hop happy craft brewers. Mt. Hood is not an early maturing hop like its Bavarian blood mother, probably on account of the differences in terroir. Summers in the Willamette Valley, with its South-North mountain ranges, tend to be much hotter and drier than the Hallertau region in Germany, which is nestled at the base of an East-West mountain chain. Mt. Hoods mature around August 27th, while the German noble mother is primed for harvest around August 25th in the Fatherland. Take a peak at the analytics. German grown Hallertau mf is poor yielding, low alpha (3-5%), low cohumulone (20), low total oil (0.8 ml/100g), low myrcene (40), high H/C ratio (3.4), has a trace of farnesene and stores fairly to poorly. Oregon-grown Mt. Hood, by contrast, has excellent yield, higher alpha (5-7%), slightly higher cohumulone (23), twice the total oils (1.6), a lower H/C ratio (23) and stores much better. Flavor and aroma? They are nearly super-imposable. 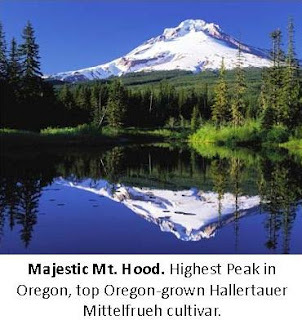 Mount Hood: “refined, spicy aroma and clean bittering.” Hallertau mf: “mild spicy and pleasant.” Liberty: “spicy, mild, resiny, flowery.” Of course, neither Al, nor this budding hopster, would presume to be the ultimate arbiter on taste. How about overall US consumption? Here’s where I scratch my head. It appears a few crafties continue to be willing to pay more for the mystique. In 2009, German grown Hallertau mf imported to the US ranked 17th (34,123 lbs). The US grown cultivars ranked as follows: 9th, Crystal (65,631 lbs); 20th, Mt. Hood (32,148 lbs); and 83rd out of 88, almost dead last, Ultra (250 lbs). Hmmm. Why would some crafties want to spend more for German grown hops? Even if it means a bigger carbon footprint, a less reliable supply, and putting Oregon hop farmers out of work? Perhaps it’s all about the grand experience of boarding a plane to Munich in the late summer ostensibly to inspect the hop harvest. Hey, we got beerfests in the Northwest, too! Finally, consider this. Aroma hops grow and mature differently than super alphas. They need more care, and thus their price is higher. The plots are smaller. An investment in Oregon hop farmers will help secure a diverse, reliable, sustainable, and quality pipeline in the future. Saazer vs Sterling: Do You Want Sizzle or Steak? Saazer is a land race, noble aroma hop whose “Old Europe” mystique may overshadow a few telling flaws. It’s a low total oil, low alpha acid, low co-humulone classic hop renowned for its spicy and herbal flavors. Over the last 700 years, Saazer hops have survived wars, famine, invasions, Nazis and Communist collective farming in the tiny town of Zatec (formerly Saaz), in what’s today the Czech Republic, about 50 miles south of Dresden, Germany. 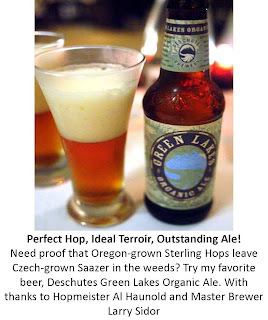 In 2009, Saazer (Cz) ranked as the 7th most used hop in the Brewers Association 2009 hop usage poll, just behind it’s more robust US offshoot, Sterling. Sterling, as we’ll see, may not carry the mystique of a land race Euro hop (think castles, coats-of-arms, Oompah bands), but US farmers and craft brewers love it. Saazer hops have been beset by unsteady availability and small yields. The acreage has not expanded in decades (centuries?) and the yields by US standards have been dramatically low, which of course has helped push up its price. It was the uncertain supply and wild price fluctuations that prompted US brewers back in the early 1980s to grow Czech Saaz in the U.S. At the time, the walls of Communism were beginning to crack and the Czech people were poised to embrace the promise of capitalism. A prominent US brewer began growing Czech Saaz in Northern Idaho in the 1980s on a farm near the Canadian border (aka, “the Boundary Farm”), which was owned by Anheuser Busch. The latitude of the Boundary Farm was similar to the Saazer region but the former’s growing season was a tad shorter. Dr. Cal Skotland, a plant pathologist stationed at Prosser, WA found and destroyed the Prunus Necrotic Ringspot Virus in the original planting stock he got from Czechoslovakia This virus, commonly found in many older hop cultivars around the world, was probably retarding the yield of the hop back in its homeland as well as reducing its alpha acids potential, but went unheeded under a see-no-evil Communist regime. So, in the late 1980s, the stage was set. Noble aroma? Check. Low yield in it’s Bohemian homeland? Check. Low alpha acid? Check. Low oil? Check. Throw in the Ringspot Necrotic Ringspot virus with a gathering threat of the Apple Mosaic Virus and you have all the elements of the kind of perfect hop storm that our very own Dr. Al Haunold was put on this Earth to clean up, amp up, oil up, and let her rip. Al obtained virus free clones in 1990 from the Washington Experiment Station at Prosser, and immediately set to work cooking up a new cultivar. His mission: higher yield, more alpha, similar storage potential, disease resistance and a compatible oil profile. All very good, kind sir, but wait a second. The rootstock was infected? This budding hopster was still hung up on the virus thing. Al decided to cross the virus-free Czech Saaz female with a vigorous male plant that had Cascade and German aroma parentage with a smattering of higher alpha potential from Brewer’s Gold. His vision was to design a lush growing hop plant that would fill in the spaces between plants in each row, so it would look like a solid green wall with plenty of side-arms and lots of cones, in contrast to the sparse cone set normally obtained with Saaz plants. “Czech Saaz have puny sidearms with short secondary and tertiary branching,” he noted grimly. “The cone volume is weak, about 20 per sidearm. We wanted longer sidearms with 30 to 50 or more cones on average. Also, Saaz cones tend to be light, brittle and smallish. We wanted something more substantial.”Done. Al bred a robust cultivar whose parentage was ½ Saazer, ¼ Cascade, 1/8th German aroma, plus a smidgen of Brewers Gold, Early Green and more mystery hop. The yields shot up about 80% (4 bales, or about 800 lbs per acre on average in Czech hop yards vs. 8 - 10 bales, or 1600 to 2000 lbs per acre, in the Valley). Alpha acid edged up from 3-4% to 6-8%, while co-humulone, one of the major alpha acids fractions stayed in the expected Saazer range. Total oil pumped up from .6 to 1.3 ml/100g, while farnesene, the characteristic Saazer hop oil component, stayed within the expected 11 – 15% range. Al established a four acre plot in the Valley in 1991. At around that time, Coors took an interest. The details are sketchy, but after it’s initial romance with Sterling, Coors broke it off in a few short years. Another source, not Al, who retired from the USDA in 1995, advised me that a farmer in Washington hijacked a few experimental Sterling-related rhizomes, planted them before they were ready, and harvested the cones too early before its oils fully flourished. The net result was Coors soured on the imposter, which wasn’t a bad thing, since the crafties thereafter discovered Sterling when it was finally released in 1999 by Al’s successor, Dr. John Henning. The crafties, we know, have been hopping up their brews ever since, including Deschutes, which showcases Sterling in my favorite brew, Green Lakes Organic Ale, the brainchild of Ueber Brewer Larry Sidor. Now you might think that an eight year lag between a promising cross and it’s public release speaks of pokiness. You’d be wrong, according to Al, a hard charging man who by no means suffers dilly-dallying gladly. It takes time to get it right. For example, he teaches, a farmer cannot rush into harvesting Sterling. It cannot be plucked before it’s time. If he does, the brewer is not likely to get the desirable oil profile or its characteristic citrusy flavor and most likely not the full alpha acids potential. How does a farmer know when it’s time to pick Sterling (or other US aromas, for that matter)? Is it simply a matter of analytic testing? Or, like those warthogs who can sniff out a truffle under two feet of mud, does one instead need a sensitive snout, a delicate touch and an acute ear? For Al Haunold, it’s all about the personal touch. Well said, Al. And thanks for the reminder to take the time now and then to stop and listen to aroma hop wunderkinds like Sterling. Hop History With Dr. Haunold, Part V.
Perle: Is it an Alpha Hop? An Aroma hop? Or Something In Between? Not until, that is, they were busted in the late 1970s by a scientist who, at an international meeting, stood up and said, “Wait a minute you bearded Bavarian boys in lederhosen, this hop you call Perle quacks, waddles and paddles like a Northern Brewer. Pray tell, what’s in it?” For years the Germans resisted disclosing the pedigree, vainly trying to keep the lid on the truth as long as possible, during which time they could happily exploit the alleged Hallertau lineage. Finally, in 1978, the Germans gave up the goose and admitted their beloved Perle was actually the progeny of a Northern Brewer crossed with a male of unknown pedigree (I guess it could have Hallertau bloodlines). As hopworld “dust-ups” go, this was big – big enough to draw out the young Dr. Haunold, our very own People’s Hopmeister and delightful stickler for the truth. In 1980, Al propagated a plot near Corvallis, harvested same and tested it. 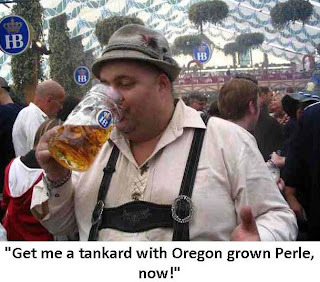 The alpha of the German grown Perle hovered around 8%, but the alpha in the Oregon grown cones shot up to 11%, with some tests ringing the bell at 12% or slightly higher. Al and his chemists had spent years evaluating “noble aroma hops” in order to figure out their mystique so he knew a little about the major quality components that traditional brewers expected from these esteemed, boutique hops for which they had unflinchingly paid premium prices. But what made the Oregon- grown Perle richer in alpha acids? It’s all terroir, baby. The answer, to this day, remains something of a mystery, but if Al were to speculate --speculation being a rank and vulgar practice of histrionic lawyers and pseudo-scientists, -- the good hopmeister would offer the following. Oregon’s hop yards line up with the 45th Northern Parallel, while the German yards are further north on the 48th Latitude. As a rule of thumb, the closer a hop vine is to the equator, all other things being equal (ceterus paribus! ), the higher the acid in the cone (as a % of weight). Added to which, size does matter: the smaller the cone, the bigger the alpha juice jolt (your basic inverse relationship). Oregon Perle cones were generally smaller than their German grown sisters, but probably due to a confluence of agronomic, water supply, soil quality and climactic factors, the Oregon yields tended to be higher. So there – rank, raw, crude, unwholesome speculation. The question you have to be asking by now is, OK, how does any of this affect the price of hops in Hubbard, Oregon? Here’s the deal. Let’s say you’re a brewer. Your recipe calls for Northern Brewer. We suggest you consider Perle. Why? Oregon - grown Perle has higher yields than Northern Brewer. Indeed, the main driver of N. Brewer in the States for years was Anchor Steam Brewery, but few growers wanted to hassle with it since the yields were so low, in part because the hop was infected with several viruses. Yields of US grown Perle (mostly virus-free) are reliably between 1,400 and 1,600 pounds. Both are touted for their “minty” or “evergreen” flavor, but Perle has higher alpha, and stores quite well – as Al puts it, “Perle is a good keeper. If you’re vacillating between US Perle and Germany Perle, consider these factors. The US - grown Perle has much higher yields and probably more reliable (Verticillium wilt is not the scourge here that it is there).You will get 20% more alpha. You will be keeping US growers alive. Buying locally will also save you money, especially today in view of the strong Euro and weak dollar. And besides, why reward the Germans for perpetuating the myth that their Perle has Hallertau bloodlines, a ruse designed to jack up both the mystique and the price? Unlike the cultivars we’ve discussed to date, Al did not breed a new Perle derivative. He was simply the first to pry a few rhizomes from the Germans and plant them in Oregon, where in fits and starts they’ve flourished ever since. In the 2009 BA Hop Usage survey, brewers surprisingly continued to buy more German Perle than US Perle (29,550 lbs vs. 21,965 lbs, respectively). Indie Hops will plant Perle on the Coleman Farms near St. Paul, Oregon, in 2010 with our baby harvest in 2011. We’re excited to get brewer feedback as, over time, who knows exactly what exciting flavors and aromas await. Al’s expertise stops when the hops hit the boil. For that, we defer to the nose and tongue of the brewer. Santiam, US Tettnanger, Fuggles: Will the Real Tettnanger Please Stand Up? Many of you may be buying “US Tettnanger” with the belief that you’re getting a hop that carries the same oil, aroma and flavor profile as its noble namesake from Germany. But you’d be wrong. The so-called “US Tettnanger,” according to Dr. Al Haunold, is actually Britain-born Fuggles. Al tried to correct the misnomer back in the late 1980s, but his call for truth in advertising and science fell on deaf and dumb ears, and the myth persists today. Lets go back to the 1980s. Anheuser-Busch (AB) was importing German-grown Tettnanger hops, a landrace noble aroma hop which thrived in a small terroir in the Southwest region of Germany near the Lake Konstanz on the Switzerland and Austrian borders. AB wanted to free itself of dependence on Germany for Tettnanger, whose oil and alpha acids profile was similar to Saazer hops from the Czech Republic. Dr. Haunold propagated a small plot in Oregon and noticed a few oddities. First, Tettnang was supposed to be an early maturing hop with classic bronze and reddish coloration on the main stem near the side-arm branches. AB’s version matured slightly later and the relevant regions on the main stem were dark green. Second, Tettnang was supposed to be high in farnesene (11%), but AB’s version was much lower (4%). Our Public Hopmeister ran the usual battery of tests and discovered that ratio of alpha to beta also did not fit the expected Tettnanger profile. Hmmm. Something’s fishy. This isn’t Tettnanger, Dr. Haunold concluded – it’s actually Fuggles. Al had just put the finishing touches on his four Hallertauer Mittelfrueh progeny: Liberty, Mt. Hood, Crystal and Ultra. “I wanted to focus on the farnesene levels and develop a Tettnanger/Saaz mimic that would produce much higher yields,” noting that in Germany typical yields in the Tettnang region were around 5 - 6 bales (about 1200 lbs) per acre, well below the desired output of about 8 - 10 bales, a threshold level above which growers could actually earn a profit. . Unfortunately, today, very few hop merchants are contracting with US growers to plant Santiam. According to the BA survey of hop usage in 2009, brewers used only 249 pounds of Santiam, compared to 77,500 pounds for Saaz (CZ) and 3,230 pounds for Tettnanger (GR). It looks like the bigger crafties (think Boston Brewing) are content paying more for European imports on the image-driven premise, oddly enough, that Euro hops carry more panache than American varieties. So there you are. Why spend more for European Saaz and Tettnang hops when you can buy Santiam, which is nearly indistinguishable, has slightly more alpha and it can be grown locally? Indie Hops will put substantial acreage of Salmon-Safe Santiam in production this year with our Oregon farmers (the original test plots for Santiam were located in the former John I. Haas “Alluvial” hop yards which are now part of the Coleman farms). 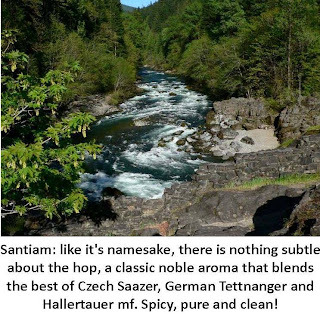 We are pleased to help revive this unsung aroma hop hero --let the Santiam run free!